There are surely many supporters of President Donald Trump around the country who believe God wanted him to become the leader of the free world, but Sarah Huckabee Sanders explicitly said so on Wednesday. 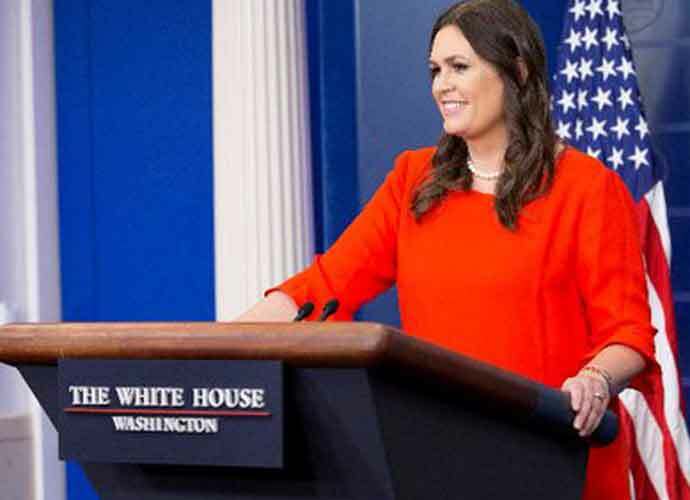 In an interview with Jennifer Wishon and David Brody of the Christian Broadcasting Network, the 36-year-old White House Press Secretary responded to a question about a “spiritual perspective” on Trump’s time in office. Most evangelical Christians in the U.S. support Trump, and some of the religious branch’s prominent leaders have defended the president in television interviews even despite Trump’s long history of adultery, sexual misconduct and denigration of women, minorities and immigrants. This is also not the first time a member of the Trump Administration has cited God or Christianity. Last summer, during the immigrant family separation crisis, Sanders and then-Attorney General Jeff Sessions both cited the Bible as an excuse when discussing illegal migration by saying the law should always be obeyed. Brody and Wishon also asked Sanders about her views on two first-term Muslim Democratic congresswomen, Reps. Ilhan Omar (D-Minn.) and Rashida Tlaib (D-Mich.). The two young lawmakers have been criticized by conservatives for their backing of the boycott, divestment and sanctions (BDS) movement, which condemns Israel’s treatment of Palestine. Republicans have accused Omar and Tlaib of holding anti-Semitic views. Sanders — whom Trump recently complained is covered “rudely and inaccurately” by reporters during news conferences — called Tlaib and Omar’s remarks on BDS “outrageous” and said their fellow Democrats should have denounced them. Sanders also reiterated Trump’s support of Christians in Syria and said the president is “tough” on Iran. “Look, the president’s made clear that we support Christians, that we support the Kurds,” said Sanders. “He’s made that clear to Turkey, he’s made that clear publicly on a number of fronts, and just one of the reasons that the president has been tough on Iran is to make sure that people don’t feel threatened. Last month, Trump said he planned to withdraw troops from war-torn Syria. Congress and international allies have expressed worry that an abrupt withdrawal from the country could embolden ISIS.